And murmuring goes on his rebellious way. And yearns, but asks not, for the faith that cures. We’ve all heard about “The Roaring 20s” and the “good ol’ days” of the decades following. Mr. Baring wrote this poem about that generation, his own era. But he well knew that he wrote of – and to – EveryGeneration. He wrote to ours. Reading the poem, don’t we all sadly consider our own society, our own age of despair, faithlessness and shutting out of God? The Savior of the world once sorrowfully asked His friends, “When the Son of Man comes, will he find, do you think, faith on the earth?” (Luke 18:8) The very asking seemed to prophesy future generations’ apathetic, faithless wandering. Our Lord also lamented at the lack of hope and confidence in His very own disciples (“Why did you doubt…?) and prophesied that “the charity of the many” would grow cold. As we see the world marching on its obstinate path away from God, we take heart in the example of souls who did believe, did hope and indeed loved! And were instruments of good and grace to transform the world, not only in their own time, but in centuries to come. These were the souls who found strength in understanding deeply their own weakness – and God’s mighty strength. Our holy mother, St. Teresa of Jesus, was surely one of these. As we close the year of celebration in honor of the 500th Centenary of her birth, we have been reading in community a beautiful book: The Divine Adventure: St. Teresa of Avila’s Journeys and Foundations. In it, we are learning yet more about this mother of souls, who attracted so many from a hum-drum, superficial life to a fervent life of love and sacrifice for God and His Church. God strengthened her in a heroic struggle against her own tendencies to be satisfied with the shallow, passing things of life and transformed her into a truly valiant woman. She had to deal with all sorts of people, both good and bad. She faced and fought, with all her soul, wretched politics and accepted standards which were bent against the rights of God and the good of souls. Source material for the book is not only from the Saint’s own writings, but the fascinating letters and official reports and travel logs, filled with the impressions of those around her, who traveled with her and shared her journeys, adventures… and mis-adventures… for there were many accidents, hardships and trials on those long journeys. She boldly stood up to bullies of all kinds, taking refuge in God’s so very constant help. The book offers not only interesting details of these encounters, but a fine spiritual view, the viewpoint of faith in a loving Providence (“God’s ways”) that used people and events to accomplish His sovereign Will in the world He created, however wayward it becomes. Another Carmelite saint who defended God’s rights, in times of political corruption and upheaval in his own country of Portugal, is Nuño Alvarez Perreira (Feastday: November 6). Here again, a soul painfully and firmly convinced of his own poverty, became great – and a great lover of God and His holy Mother. He was the wealthy knight and founder of the Braganza Dynasty in Portugal, and the highly respected general of an army, whose men trusted him implicitly for the very reason that he was a man of God. His humble opinion of himself and his love of Our Lady led him, after the victoriously-fought wars were completed, to make application as a lay brother to the Carmelite monastery, where he lived until his death. An excellent book tells the captivating story of St. Nuño: The Peacemaker Who Went to War. This is truly another “adventure story” that reveals the heroic virtues of a warrior for God and country, who never lost the admirable qualities of a child of God. What makes this book special is its reference of Nuño’s life and work to our own time. Very relevant, indeed, since the wars he fought were in the very location of the Blessed Mother’s chosen place of Fatima. St. Nuño, along with St. Catherine of Siena and St. Joan of Arc, who both lived in his time, were “chosen vessels of hope, faithful servants who in passing through their world called it to order,” as Maria Cirurgião wrote in a wonderful article published soon after his canonization in 2009. Both St. Teresa and St. Nuño cherished a deep, intimate life with God in the midst of very public activity. But what about the young woman who became “the greatest Saint of modern times”? Is to see God reign in every heart. Chaplets then focus on a particular aspect of the Faith – or of a person: the Holy Face of Jesus, for example, or His Sacred Heart, or the Blessed Sacrament. The sorrows of our Blessed Mother are commemorated in the Seven Dolors chaplet, and the Franciscan Crown honors the joys of Mary. Angels and numerous Saints have chaplets composed in their honor – to promote understanding of their lives of virtue and sacrifice – and to encourage our friendship with them and imitation of their virtues. Often, those who compose chaplets try to have the number and even the color of the chaplet’s beads symbolize the message or lesson it conveys. So for example, let us consider the interesting Chaplet of St. Joan of Arc, since we have just mentioned this great Saint. The chaplet’s colors are royal blue and red, to symbolize the deep loyalty and love of St. Joan for the French nation and monarchy as extensions of the reign of Christ on earth. To the medal of St. Joan is attached a small, separate Fluer-de-lis medal, the very unique symbol the French nation adopted for its own loyalty and fidelity to one God in three Divine Persons. Perhaps our own Community’s favorite and most used chaplet is the Chaplet for the Souls in Purgatory. We are pleased to know the holy priest who composed this chaplet, as well as the good Bishop, now retired, who gave its approval. The chaplet, usually made with black beads to represent the mournful, mysterious separation of death, begins with the Psalm of sorrowful longing (129): “Out of the depths, I cry to you, O Lord; Lord, hear my voice!…” Using invocations from the Requiem Mass and Office, the chaplet sends pleading prayers to the merciful love of God for the suffering souls, while drawing the person who prays to a deeper perception of and compassion for that suffering. “Short prayer pierces heaven,” wrote one spiritual writer, and this chaplet, along with chaplets in general, tend to follow this sound principle regarding prayer. We invite you to discover this for yourself, or share it with loved ones, by perusing the various chaplet selection on our site – certainly a modest selection, since chaplets are plentiful in number and have a long history! Our newsletter is often the way people find out about gift ideas for special occasions. The Sacred Suncatchers are among the really unique gift items we offer. Each of the images used for the sun-catchers is an exact full-color reproduction of a stained glass window found in some of the most beautiful churches and chapels in the country. Handcrafted, they are framed in lead and encased in clear glass for lasting protection. They come with a sturdy chain for hanging and vary in size and shape, most measuring about 7-1/2” x 10-1/2”. They offer a fine decoration for home, chapel, classroom, office or study. We have been pleased to send these handsome stained glass reproductions all over the world – as far as Japan! This shows just how appreciated these special art pieces are. A church ordered several just last week, and schools have also purchased them for classrooms. An especially unique piece is the Purgatory scene, which portrays the Holy Souls being comforted by an Angel of peace and encouragement. Besides those mentioned above, we should tell you about a few newer titles. We are pleased to see a beautiful re-issue of Mornings with Saint Thérèse:120 Daily Readings, as well as a very special treasure in the small booklet, Little Catechism of the Act of Oblation of St. Thérèse of the Child Jesus. Nothing so well articulates the doctrine of St. Thérèse as this brief explanation of her Oblation to God’s Merciful Love. You will learn much from it; you will love it. The biography of St. Thérèse’s saintly father, The Father of the Little Flower, is also now back in print. For those desiring to unite their prayers with the great Prayer of the Church, the holy Liturgy, a new offering: in one small volume, both The Little Office of the Blessed Virgin and The Office of the Dead (In Latin and English). Third Order Carmelites will find this especially welcome, we think, and many of you will appreciate being able to read and pray the Psalms, Lessons, Verses and Responses in the beautiful Office of the Dead. You will find in this book material for mental prayer and reflection throughout each day. Be sure to read and profit from the brief Introduction of this little book. We again recommend for the understanding of the Church’s teaching on Purgatory, two books especially: The Biblical Basis for Purgatory by John Salza and Fr. Arendzen’s Purgatory and Heaven. Lastly, do not forget to order your new 2016 Liturgical Calendar! These months have continued to be filled with sewing, embroidery, gardening and repair projects. Trying to be good stewards over all that God has provided for us here in our monastery, we have found that the repair and improvement projects keep us the most busy these days. We’ve built new fabric storage shelves in the sewing room and replaced a set of old bookshelves in the library; divided an old, grassy patch of daylilies in the garden and created a few more patches; had foam insulation added to the monastery building to help with the high winter heat bills; finally dealt with the demise of a very old freezer and replaced it; had a laundry dryer, kitchen oven, and hot water heater repaired, along with some other plumbing “issues”; added, thanks to a dear friend and benefactor in Florida, a flagstone path on the monastery grounds, as well as stone edging for the large garden (to keep the grass out! )…The list goes on and on, and just looking at that list makes us a little dizzy to realize just how much, by God’s grace, we’ve taken care of over these last few months! As you home-owners know, nearly 30 years can take its toll on a well-lived-in home. Even our enclosure wall is calling out for repairs, as the extremes of weather here in Colorado send punishing winds, heat, cold, wet and dry. All our outdoor statues were showing weather wear, too, with cracked paint and a few unsteady stands. In late August, our Sister Painter got to work, and as each one got a fresh coat of paint, they seemed to stand a little taller than they did before. The shrine of Our Lady in the front courtyard was of most concern, since the wood pedestal, built over 20 years ago, was showing signs of decay from moisture over the years. Currently, the area is without Our Lady’s image, as we repair and paint the backdrop and wait anxiously for the completion of a new, sturdier stand – constructed of metal this time. With many small openings at the bottom of this new stand, rain and snow will not settle there, and Our Lady will be safe there for many years to come. O my Jesus, forgive us our sins; save us from the fires of hell. Lead all souls to heaven, especially those most in need of Thy mercy. The emailer seemed rather annoyed and asked us to explain something she could not understand: “Why is that prayer in the rosary?” she asked. “We know that ALL souls do not go to heaven, so why are we praying for that to happen? This notion that everybody is saved is so popular these days, but it’s not true, and this prayer seems to support it!” We could understand this poor woman’s worry and annoyance, to some degree, but as our recreation discussion proved, no Catholic should have a problem with this very beautiful aspiration given us from heaven through our Blessed Mother. 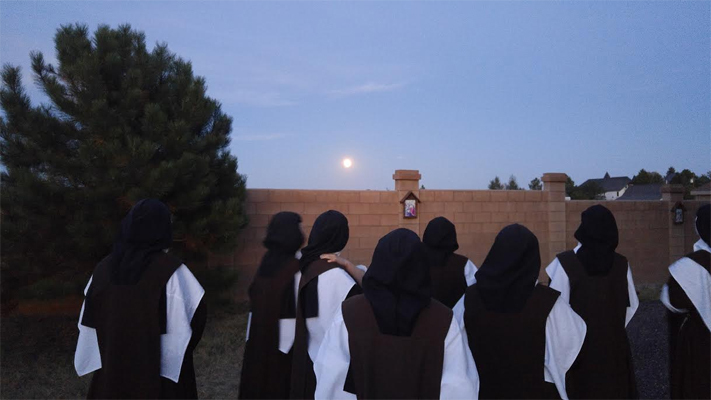 Quickly, the Sisters at random recalled scripture passages that teach God’s truth about this matter of sinners being saved. Granted, tragically not all are saved, for Christ told of the proclamation of judgment at the end of time: “Depart from me, accursed ones, into the everlasting fire which was prepared for the devil and his angels…” (Mt. 25:34) . Many of His parables teach this as well, especially the parable of the wedding feast, which ends with the solemn words, “Many are called; few are chosen.” (Mt. 22:1-14) Hell does exist and souls are there. But two beautiful passages from the Book of Ezechiel, express emphatically, “As I live,” says the Lord God, “I swear I take no pleasure in the death of the wicked man, but rather in the wicked man’s conversion, that he may live. Turn, turn from your evil ways! Why should you die…?” (18: 23 and 33:11) As well, St. Peter’s 2nd Epistle, speaking of Our Lord’s Second Coming, wrote, “The Lord does not delay in His promises, but for your sake is long-suffering, not wishing that any should perish, but that all should turn to repentance…” (3:9). Tenderly, the Lord spoke through the Prophet Isaias, “Come now, let us set things right… though your sins be like scarlet, they may become white as snow; though they be crimson red, they may become white as wool. If you are willing, and obey…” (Isaias 1:18) The contrast reveals the simple truth of God’s supreme regard for His gift to men of free will: if you are willing! No one is saved who does not will it, who turns away from the Good, from God. St. Augustine even says, “Christ had the Blood with which to redeem us… If you want the Blood of your Lord to be given for you, it has been given for you; if you do not want it to be given for you, then it has not been.” How much our cooperation and partnership with the good God is necessary for us to be saved! And an important part of that collaboration includes prayer for one another. We in Carmel are consecrated in a particular way to “collaborate” with God’s will to save souls, but all the members of Christ’s Body have a happy share in that call to pray always for one another – and for sinners, near and far; those we know dearly as well as strangers very far from us. Our Lady’s short aspiration, “O my Jesus…” can fulfill that family duty we all share, “to bear one another’s burdens” and help to bring all the children of God safely home. Recreation! Certainly not all our recreations are theological/moral discussions! While working with our hands, we talk of many things, share amusing stories, and yes, tease one another a bit. One Sister’s voice, when telling a story, tends to turn into a sort of comical yodel, which she uses to her advantage to entertain the rest of us. Another Sister simply cannot tell a joke without laughing all the way through it. 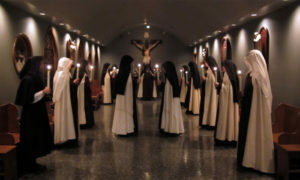 As a postulant this was the case with her, and now, years later, nothing has changed: she begins to chuckle, then laughs so hard through the whole thing, so that we can hardly understand what she’s saying – – but that, far more than the joke she is trying to tell, is what gives us a healthy dose of laughter ourselves! So, recreation can be both serious and quite hilarious, but always with reminders that God is with us, observing and guiding our conversation and time together. We have a small set of wooden “clappers” that the week’s Sister Bell Ringer occasionally sounds to stop all talking for a short moment of silence and spiritual communion. Topics that come up at recreation almost always include what we call “critter stories” – encounters with either birds, bugs, bunnies or butterflies – and sometimes spiders and squirrels. Just now, the monarch butterflies are migrating, and a good number of them can be seen these days in the yard, sipping from whatever is left in the garden.